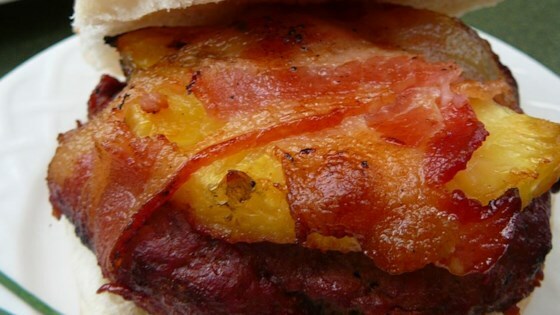 "Seasoned hamburger and a slice of pineapple are slapped together, and wrapped in bacon. It's that easy, and adds a wonderful flavor to a regular burger! This recipe was one of my grandmother's favorites. We would make these special for her when she would come up to see us." In a large bowl, mix together hamburger meat and barbecue sauce. Season with salt and pepper. Shape mixture into 4 large patties. Place a slice of pineapple on top of each. Crisscross 2 bacon strips around each burger, and secure with toothpicks. Brush oil on grate. Place burgers on grill over medium low heat. Cook, covered, until the burger is cooked through. Turn often to avoid burning the bacon. I used this recipe for chicken breats and it was great. Can't wait to try on hamburgers! Thanks! I loved these burgers. I took ground turkey with crushed pineapple, turkey bacon, grilled pineapple rings, grilled red onion, and barbecue sauce and served on a bun. SOOO Good. I think this was great, my family loved it. the only thing i would leave out is the BBQ sauce ,it made the burgers fall apart .